Bertrand Chaffee Hospital (BCH) has announced that it has completed the purchase of the Concord Medical Group building (210 East Main Street) and associated property. This purchase is a crucial first step toward transforming our campus and increasing access to primary and specialty services. BCH is eagerly waiting for a decision from the New York State Department of Health on a funding request through its Statewide Healthcare Facility Transformation Program application. Our $11.3 million proposed project includes funding to develop the property, create a modern and efficient medical office building, and improve access to vital healthcare services in our community. BCH will share news about our grant application and plans to develop this property as that information becomes available. Since opening in 2012, the Bertrand Chaffee Hospital Heart Center has been able to expand to meet the demands of our community. Services and capabilities include outpatient and inpatient consults, echocardiograms, all types of stress testing, pacemaker interrogation, and nuclear medicine. In 2016, the Heart Center enhanced its services by adding the Leg Pain and Vascular Center to complement its cardiac care. Leg vein ablation, an outpatient procedure for varicose veins and chronic venous insufficiency, was added late last year. Providers in our Heart Center see patients with cardiac and vascular conditions, and provide diagnosis, treatment options, and referrals for more intensive interventions, like surgery, if indicated. The Heart Center’s providers take care to answer patient and family questions with diligence and compassion. Cardiologists Thomas P. Smith, Jr., MD and Cyril Gunawardane, MD see patients in the Heart Center’s first floor location. Lauralee Sprague, NP, works closely with our cardiologists and specializes in heart health. 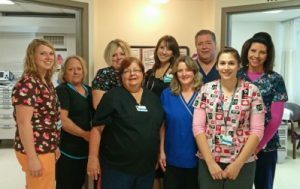 They are supported by a team of nurses and patient service representatives who handle scheduling, appointments, diagnostic screenings, treatment plans and follow up care. “Heart disease and stroke can have devastating effects, both for quality of life and length of life,” said Dr. Smith. “Our team works together with patients, their families, and their primary care providers to develop treatment plans that have the best possible outcome.” The Heart Center phone number is (716) 592-9644.